KäuferPortal (www.käuferportal.de), the Berlin-based online business, is the largest broker for premium products and services in Europe and is planning to move to new premises in the city, doubling its office space. 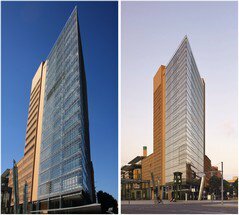 The company has taken on 8,551 m² at Potsdamer Platz 11 and expects to move in during the first quarter of 2017. Berlin, 14. September 2016 – The leasing team of Cushman & Wakefield, Berlin, was their ideal partner in helping them find the right premises and then deal with the details of the lease. The consultants from Cushman & Wakefield’s Project Management & Consultancy department supported KäuferPortal with floor planning and the design of the new offices. These will extend over seven floors and provide space for up to 500 employees, which will meet the company’s expansion plans plans of the company, currently based at Friedrichstraße 79. This move into larger premises will help KäuferPortal to keep up with its fast growth. Founded in 2008, the company evolved from startup to Germany’s market leader within just a few years under the leadership of its young founders Robin Behlau and Mario Kohle. The online service helps consumers obtain and compare quotes from regional companies before major purchases, such as a new kitchen or a solar system. In 2015, KäuferPortal announced its plans to gradually expand its services to other European countries. Together with its partners, the business now sells products and services worth €1 billion annually and employs more than 300 people in six locations across Europe. Its network of suppliers includes more than 10,000 companies from all over Europe. These include household names such as Höffner, Jungheinrich, Siemens and EON. Cushman & Wakefield is a leading global real estate services firm that helps clients transform the way people work, shop, and live. Our 43,.000 employees in more than 60 countries help investors optimise the value of their real estate, by combining our global perspective and deep local knowledge with an impressive platform of real estate solutions. Cushman & Wakefield is among the largest commercial real estate services firms with revenue of $5 billion across core services of agency leasing, asset services, capital markets, facility services (C&W Services), global occupier services, investment & asset management (DTZ Investors), project & development services, tenant representation, and valuation & advisory. To learn more, visit www.cushmanwakefield.de or follow @CushWake on Twitter.